The European Court of Justice has in an answer to a question from a Swedish court of appeal informed that private fisheries agreements with Moroccan authorities are not allowed outside of the context of the EU-Morocco Fisheries Partnership Agreement. Photo: In 2008, Greenpeace campaigned against the Swedish vessels carrying out illegal EU fisheries in occupied Western Sahara. The ECJ on 9 October 2014 passed a ruling which is part of a many-year long legal process going on in Swedish courts. The dispute has been whether it was legal or not for the fishermen to carry out fisheries activities in what the court process labeled "Moroccan fishing zone" at the same time as the EU had a Fisheries Partnership Agreement with Morocco. The entire EU fishing fleet is supposed to be taking place through authorisations given by Brussels. Two Swedish fishermen were in 2009 charged by the Swedish district court of Gothenburg with illegal fishing during a period April 2007 to May 2008. 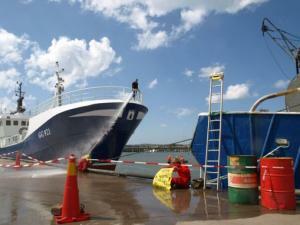 Their two vessels, Nordic IV and Aldo, did not have the relevant permissions from the Swedish fisheries authorities and EU regulations according to the prosecutor who also stated that the fishing had generated large profits, approximately 20 million Swedish kronas (2.3 million euros). After several years of postponement due partly to obstruction from the accused, the court process finally took place in October 2012. The accused claimed that they had in fact not been responsible for the fisheries offshore Western Sahara themselves during this period, but that they had rented out their vessels through separate bareboat charter agreements to the Moroccan fishing company Atlas Pelagic in Dakhla. The defence claimed that the fishing permits therefore were not needed. The district court of Gothenburg found the fishermen had carried out illegal fishing since they had indeed been responsible for the fishing and without the relevant permissions. However due to a formal mistake in the description of the alleged crime by the prosecutor, the two fishermen were found not guilty. The prosecutor appealed the verdict and in September 2013 the case appeared in the court of appeal in Gothenburg in Sweden. This time the defence claimed that a specific paragraph in the 2006 EU-Moroccan Fisheries Partnership Agreement could be interpreted as signing private agreements with Moroccan companies for such fisheries to be legal. The court of appeal therefore decided to ask for a preliminary ruling ('förhandsbesked' in Swedish) from the European Court of Justice. The answer from the European Court of Justice on 9 October is that "the Fisheries Agreement, in particular Article 6 thereof, must be interpreted as excluding any possibility for Community vessels to carry out fishing activities in Moroccan fishing zones on the basis of a licence issued by the Moroccan authorities without the intervention of the competent European Union authorities"
The Swedish fishermen supports the prosecutor's claim that the fisheries was done in an illegal manner. The date for the Swedish court of appeal to continue the legal process with a final verdict is not known. WSRW and the Swedish magazine Västsahara has followed the process closely since it began. It should be noted that it is of WSRW’s view that no fishing licence, as a matter of international law, could be given by Moroccan government for waters of Western Sahara at all. 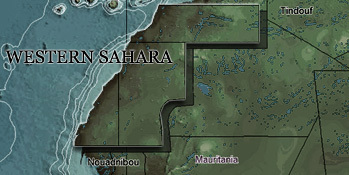 Morocco’s claim to sovereignty over Western Sahara are rejected by the international community and by the International Court of Justice. Yet, Morocco is still illegall occupying the western part of the Non-Self-Governing Territory. The ECJ is separately dealing with this question of the legality of EU fisheries in Western Sahara. Frente Polisario this year brought an action against the European Council in the ECJ for an annulment of the EU-Moroccan Fisheries Partnership Agreement.